One of the benefits of living in a city like Aix is that we and our children can move about fairly easily and en sûreté (safely). Our boys, like many other French middle schoolers, can wander through town and sit at cafés without supervision and walk or bus to their sports' activities independently. (Have I said earlier already that I absolutely relish our carpool-free life, even as I miss our U.S. carpool buddies!?) A safe public milieu is a hallmark of many European cities, although all cities, of course, have their dark sides. What is particularly interesting is how differently societies assess safety and risk, and how some elements are accepted as reasonable risks in one place, but not in another. I have been noticing such differences between French and American safety thresholds over the past few weeks. Just a month ago, we wondered about property security when we saw a beautiful basement rental apartment in the city, with barred windows and a rare garden, encircled by a very high metal fence but an awkward gate. Sécurité incendie (fire safety) came up in another apartment we viewed; it was a true aerie with tremendous views from the top of the 5-story building, but its winding, narrow stairway meant that both moving our things in and ourselves out, (in case of a fire), would be very, very difficult. Many residences here in the center would not meet general U.S. fire safety codes. The freeing of U.S. student Amanda Knox from Italy last week has brought up discussions of la sécurité personnelle (personal safety), especially of young women and foreign students. (There are 5000 such students in Aix each year, according to the Aix City News, Oct. 12, 2011 edition; I wonder how many know the local emergency telephone numbers, of which there are several.) The Knox case also stirs up the issue of political security; do you know how to reach your national embassy in case you are arrested!? Then today, Allen and I saw the most remarkable traffic and public safety exercise. 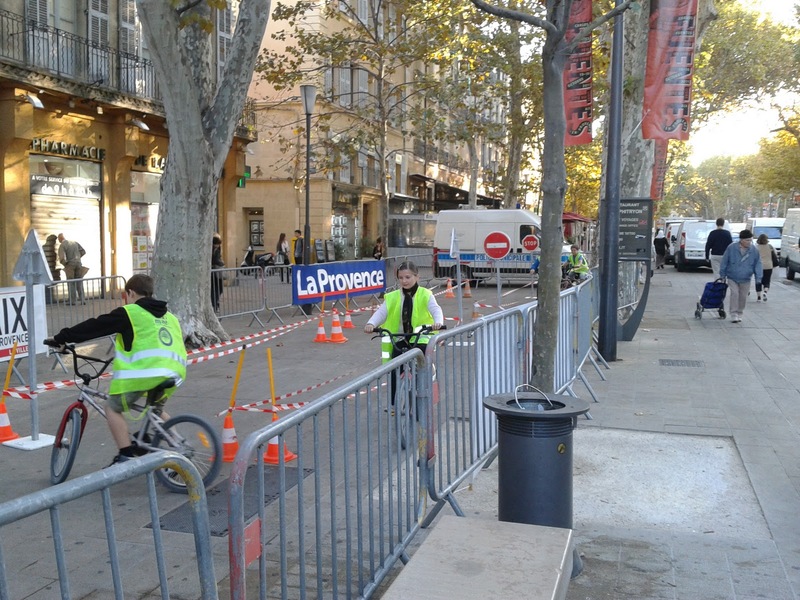 The local police had cordoned off small sections of Cours Mirabeau (the grand boulevard in Aix) to allow schoolchildren outfitted in fluorescent yellow vests to practice safe bicycle riding around traffic cones. Our boys' bicycle helmet-focused, primary school P.E. teacher would have fainted; in this publicly-organized and sanctioned event, directed by the police, none of the Aixois children were wearing casques de velo (bicycle helmets)! In fact, the only people we see regularly wearing helmets are the bicycle cops in Aix, and motorcycle and motor-scooter drivers. But then again, these drivers dart in and out of traffic in such a way that the helmets may not be enough to protect them. On the freeways, motorcyclists are allowed to drive in between lanes and cars, at rapid speeds, and I have seen and experienced a number of near-accidents where cars were about to change lanes onto these riders. In regards to this last motorway practice, my spouse made an important point, how some societies just choose to accept a certain number of traffic fatalities that might result from certain behaviors. After all, at one time, no one wore bicycle helmets or seat belts in the U.S. Some of this was due to the lack of rigorous study of the effects of wearing helmets or seat belts, but one can also see this as a matter of different social contexts and social priorities. Today, in the U.S. we are inching towards making the use of cell phones illegal while driving, yet our legal driving ages are generally lower than in Europe and we accept higher blood alcohol percentages in our drivers. This is all highly sociological, this notion that there can be significant variation among societies and across time, in terms of what is deemed safe or acceptable risk. We can also explain the decisions about acceptable risks sociologically. Some sociologists would explain certain safety risks as essentially functional or even rational for society. That people get hurt more often, or worse, die, because of certain practices, may be weighed against say, the lower personal cost of owning a motorcycle or scooter vs. a car in Europe, or against the fact that injuries and fatalities do in their morbid way, create jobs and social positions for other people. In contrast, other sociologists might suggest that the accepted risks favor and hurt different groups of people, perpetuating the inequalities between these groups. In general, those with scooters may be less economically well-off and thus less powerful, and perhaps more expendable than say wealthier drivers in their relatively safe Mercedes sedans. If we consider the case of foreigners abroad who are arrested, the 'get out of jail free' passes tend to go to those from wealthy families and countries and with the right skin color and looks. There are other sociological arguments too, suggesting that in today's highly complex, intertwined, post-modern world, we simply have too many choices in front of us, and none of them are perfect. What we decide on one issue unavoidably affects our choices and decisions on other ones, and so we make decisions that we think will work the best in our current circumstances, but the calculus we use will likely not be the same as someone else's in another social setting. In my litany above, I didn't even mention food safety, but that presents an excellent example of such overwhelming choices: what kind of food should we offer and eat, how cooked, how clean, how raw? The French have chosen to accept the risks of offering steak tartare (raw beef), foie gras (goose liver) and some moldy fromages (cheeses), because they value haute cuisine and the sensory experiences of eating, while in the U.S., we are not willing to take the risk of serving undercooked beef anymore, given the greater concern we may have for the political or economic costs arising from a potential outbreak of food-borne illness. These decisions affect other French and American choices, about the ways we raise our beef or fowl, the access and costs we create in our healthcare systems, and the messages we give our children about food. 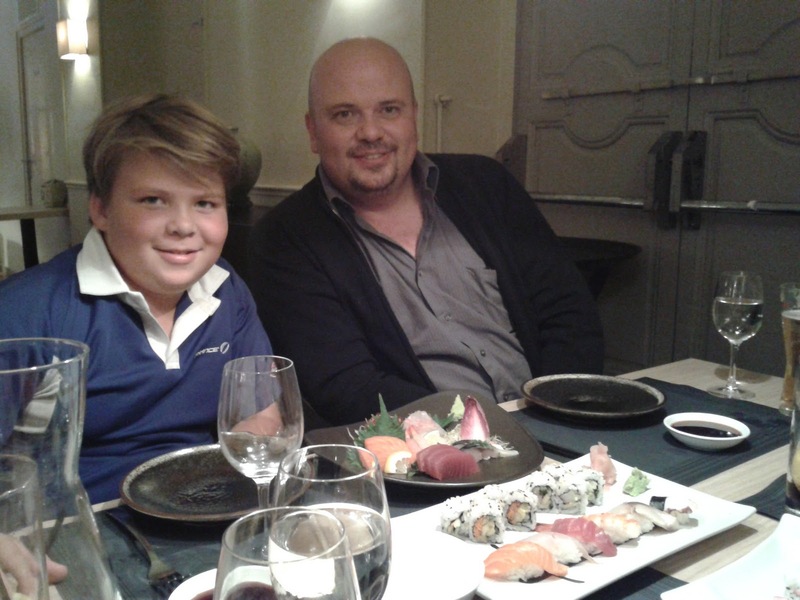 On that note, I shall end by sharing that our family's personal choice in regards to food safety is that we accept the risks associated with French dining, and we do so happily every Friday night after rugby and soccer trainings. 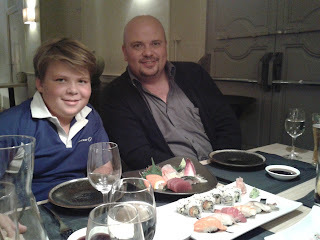 (This week, raw fish, Japanese style, at Seito). Bon appetit!